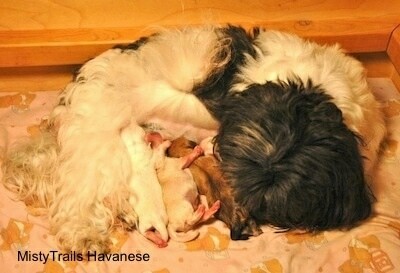 Reo gave birth to four puppies. I was fortunate enough to be there and took photos. Here's a quick look at how it went down. Bev sat on the floor for about five hours calmly coaching and helping Reo. Reo's mom Catreeya watched patiently. 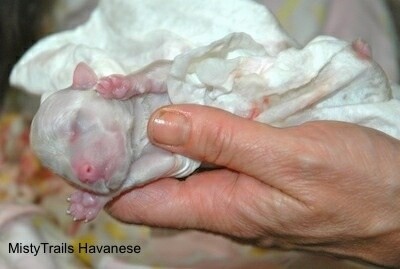 This is Reo in labor, pushing as hard as she could. She was in great spirits throughout, with no complaints at all. 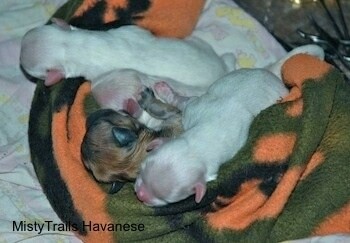 This was a textbook delivery for the first three pups but, after the three were born Reo acted like she was done. 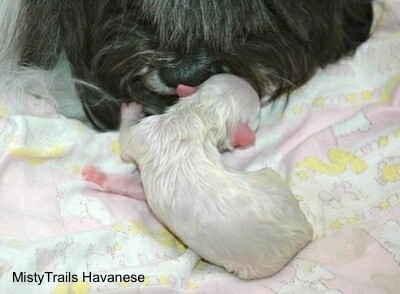 She was eating and drinking and two hours later there was still no pup, but Bev KNEW there was one in there, She was pretty sure there was. Notice Reo is already looking on with concern for her new baby. 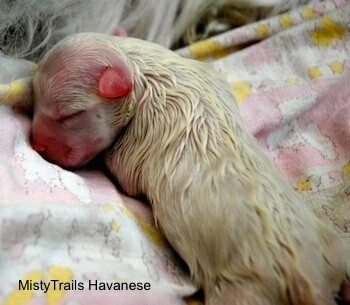 Puppy number two was born. She was aother white girl. 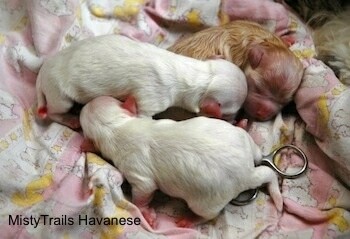 The first two puppies arrived within approx.15 minutes of each other. 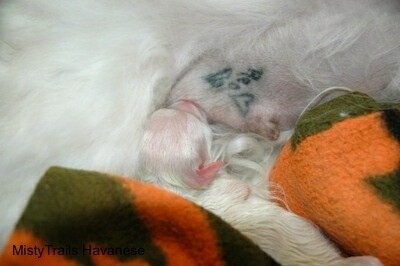 Notice the two of them feeding under the "Reo" tattoo. 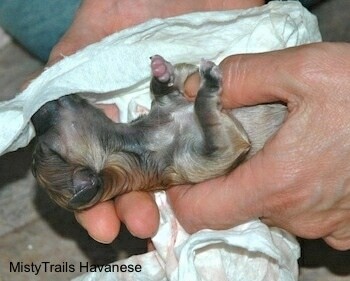 Puppy number three presenting itself. 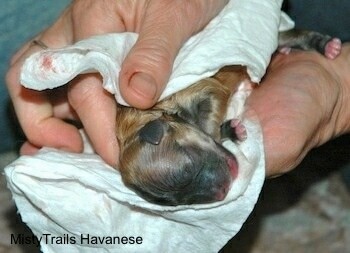 It was a little bigger than the first two pups and a little harder for Reo to push out. 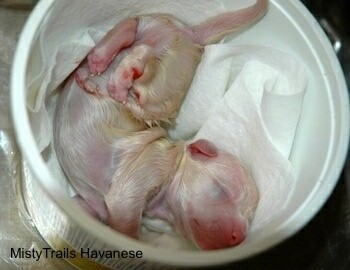 Reo was pushing and pushing and the pup was going in and out in and out. 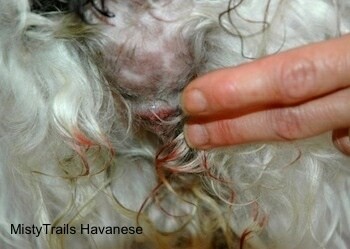 In the picture Bev's fingers have a ho ld of the head and she is pulling back on the skin. 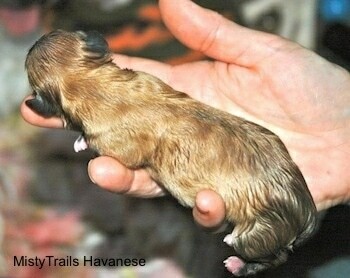 Her thumb is pushing down on the puppy to try to assist Reo in getting the bigger puppy head out. 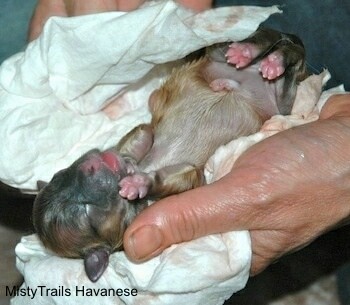 Sometimes it is helpful to the dam to hold that puppy between contractions so that it doesn't keep going back in. 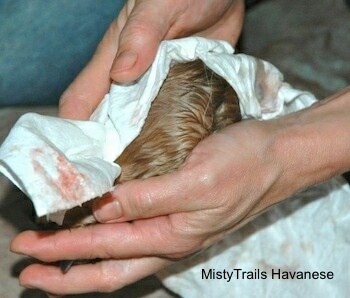 If you can get your fingers behind the neck you can sometimes help push the puppy out. A little tug also sometimes helps. Puppy number three was a champagne boy. 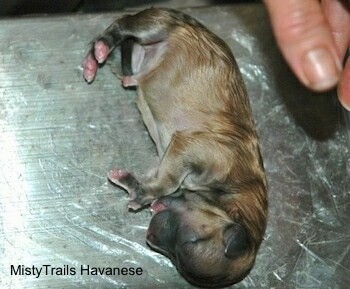 He waited about an hour after puppy number two arrived before making his appearance. Why rush? Puppy being weighed on the scale in a yogurt container. 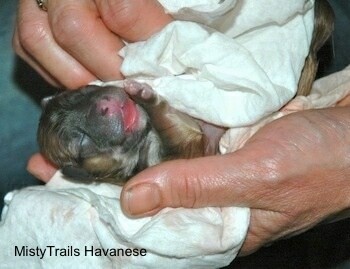 After puppy number three Reo seemed very relieved and relaxed. In fact, she ran around for awhile, hunting down and gobbling some KFC chicken which had just arrived in the house. In spite of this, Bev was convinced there was one more puppy yet to arrive, but Reo didn't seem interested in the idea any more, so Bev administered Oxytocin and subsequently Reo went into labor once again, but it was quite difficult for her. 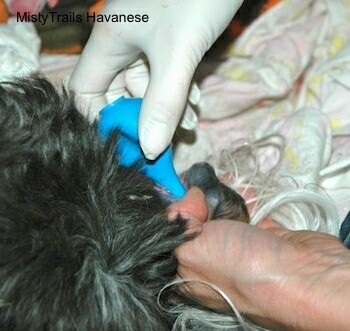 Finally, with more help from Bev, Reo gave birth to the fourth puppy, who was born quite limp and blue. 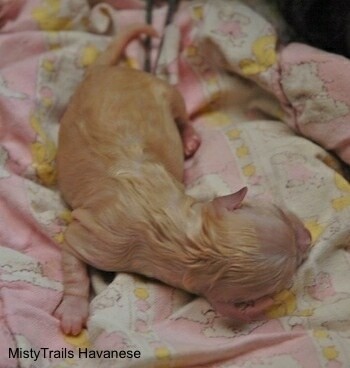 Things didn't look good or a bit, but Bev did some amazing "midwife moves", and within a minute or two, the puppy had turned nice and pink and started crying. What a welcome sound that was! 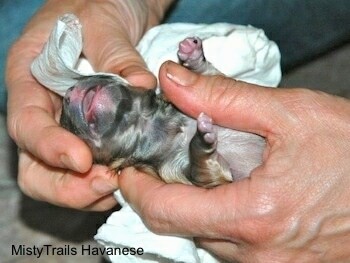 The fourth pup was blue and very limp when she came out. Most breeders would have lost her. She was full of fluid. The pup was out, but still attached to the cord. Bev sectioned the mouth. 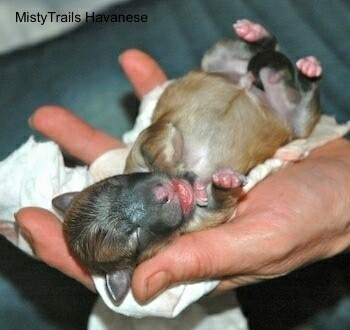 The tongue was blue white and the pup was not well. 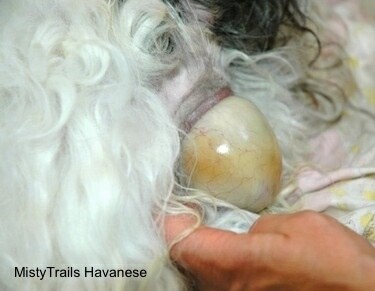 It spent too much time in the birth canal. Bev didn't waste anytime cutting the cord or trying to save the end of the cord that was retracted into the dam. 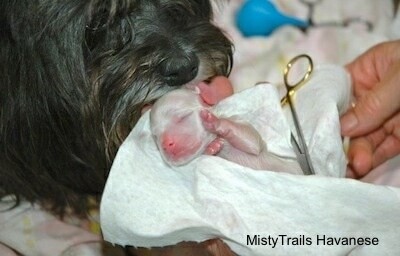 She ripped the puppy free deciding to deal with finding the placenta later. 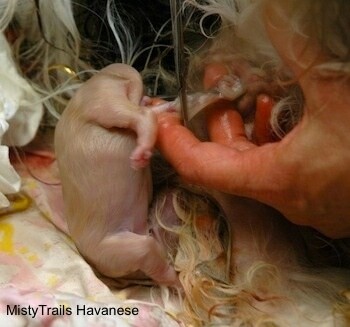 She normally puts two clamps on the cord to secure the placenta in order to get it out. She started to rub the puppy but the puppy did not respond. Bev stood up and did a gravity drop, which many people call a swing. She did not flick the puppy as some people do. 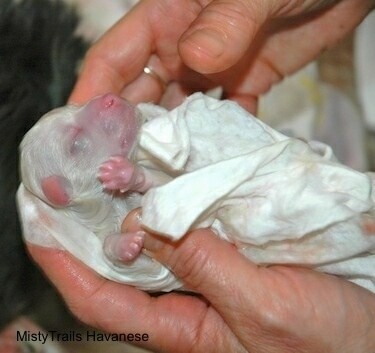 She started high and dropped fast to a sudden stop to get the fluid to move out of the lungs. She did mouth to mouth using two breaths and started rubbing under the rib cage where the heart is. Finally she got a response from the puppy. The process took about two minutes. 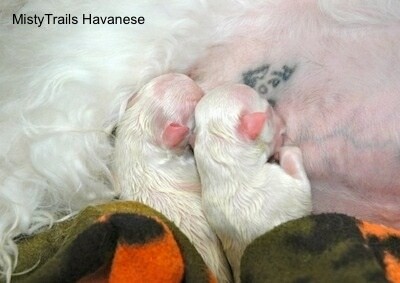 The puppy pinked up and was doing well. 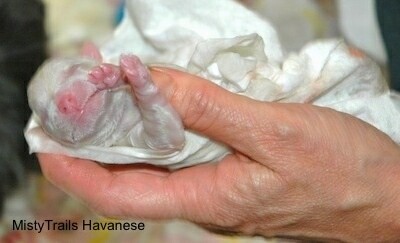 Bev got the placenta out at about 11:00 p.m.. She had started to feather her with a rubber glove and went in after it. She managed to get a string and slowly pulled it out. 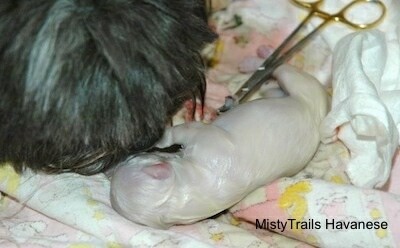 You do not want to leave the placenta inside the mother dog if you can get it out. 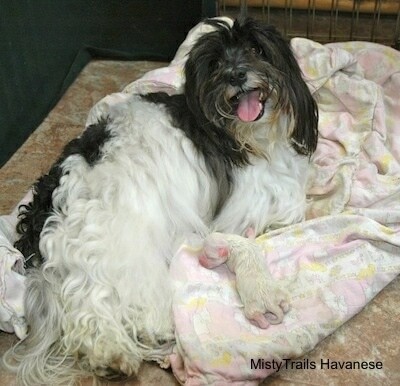 MistyTrails Double Stuf'd Oreo, peaceful and content with her four new babies. 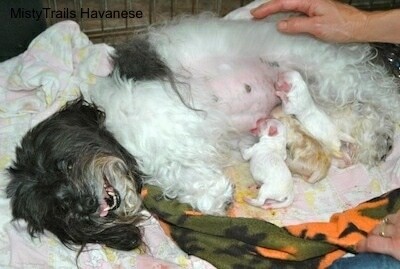 Top Havanese show dog and devoted mom. You rock, Reo! Two white girls, one champagne boy and a reddish girl. The whole process took about 4 hours. Bev is a Miracle Mom! 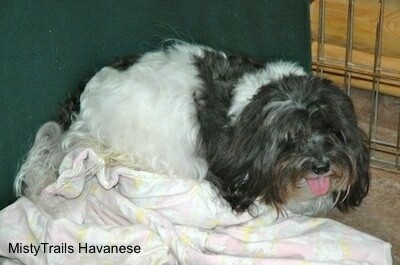 St. Havanese I call her (St. Hav for short).